OK, you asked for it, you got it! An inexpensive yet great sounding SE amp using the world renouned 300B power triode. Our design philosophy strikes again in this amplifier. Considering the fact that the 300B is pretty much one of the simplest tubes to set up and bias as an output stage, and usually sounds good single ended in anything, the real sonic quality of this 300B amplifier is in the pre/driver stage. This is where we concentrated our talent. OK, actually, I took the same driver stage for the well liked CGV-0606 and used it in this circuit, using a 12AT7 instead of the 6SL7. The 12AT7 is a very good sounding tube, and can handle the load needed to drive the 300B satisfactorily. To keep cost down, I chose the Angela 300B. It is the lowest cost 300B I have found. However, you the customer can choose any available 300B, the cost difference of course being factored in. The power supply is solid state in order to use a single power transformer for the whole amplifier. There is also the filter choke and large (200 µF) filter capacitor we use in our other amplifiers. We use the 5 volt supply normally for a tube rectifier for the filaments of the 300Bs, parallelling the cathode bias. This makes for a quasi-fixed bias for each output tube. This works very well while maintaining good stereo separation. It also helps extend the bass response. The 12AT7 is biased such that the amplification allows for an input sensitivity of 1.7 volts RMS for full output power. 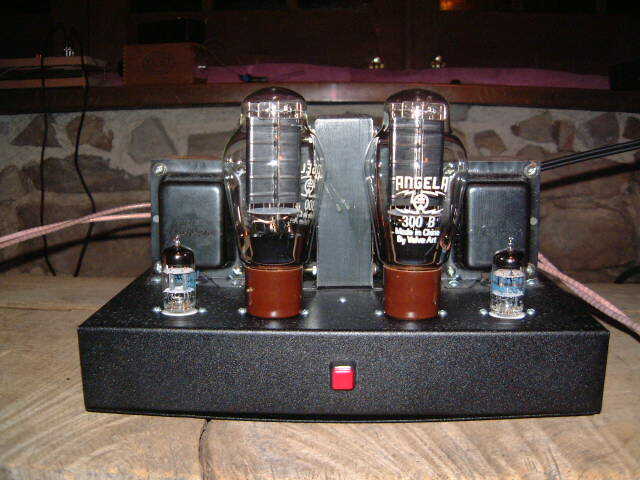 The other half of the dual triode is used as a cathode follower to deliver the full output to the 300B. The overall result is a very good sounding amplifier on a budget, and in kit form easy to build in one evening. At $949 (Kit. $1149 assembled) for a 300B amp, which is what a monoblock 300B amp (sometimes without tubes!) usually costs, you can't go wrong! Oh, also, the thing you have all been waiting for, NO NFB! That's right, me, a staunch advocate for NFB, find that it makes absolutely no difference in the sound quality in this circuit, or the frequency response. I believe that both the driver circuit, which has a very low distortion rating and the 300B tube, which is inherently pretty good about linearity, along with the very good quality of the One Electron (or whichever transformer I end up using, depending on whether the issue has been resolved), has a sufficiently low distortion. Ok, ok, I am using DC in the filament circuit. "Taboo!" you exclaim? Nah. I do not think that it is a problem, since while specs call for 5 volts AC, DC will work as well. There is no sonic difference. I get 5.12 volts from the bridge rectifier/22,000 µF filter. Looking at it with a scope, there are no spikes and very small 20mV p-p 120Hz wave (7 mV RMS), versus the 14 volt (5 RMS) p-p 60Hz one there previously. The result? The same ohmigosh sound with no noise whatever. As for the "problems" of current crowding (a term from the solid state world) or uneven cathode wear... time will tell. Output Impedance 4, 8 or 16 ohms, specified in advance for built units, selectable by builder for kits.
" Your instructions are simple and to the point. Very easy to understand. SUCCESS. Right off the bench. No flames sparks or smoke. Tested the amp out and the voltage specs you supplied are pretty close. Initially hooked up to an old pair of speakers and everything sounded fine. Hooked the amp up to my Cicadas and wow does it sound great. I have been using a modded (Another well liked brand) with all premium parts run in triode to power these speakers and I have to tell you that your amp does EVERYTHING better. It really sounds superb (Not broken in yet, either!). The hum is present but is only really noticable without program material. I am running my sources thru a homebrew passive preamp with a DACT 10K attenuator and that seems to have minimized the hum compared to my Foreplay preamp which has a little hum of its own. Thanks for the great service and tech support." *Italics mine. FYI, the instructions are now even easier, and include picture diagrams to aid in the ease of construction. However, this amp is very easy to build to begin with, as the circuit is so simple. Please email me with order request. Please allow Four to Six weeks for delivery.